On Sunday, January 13, the Sisters of St. Joseph of Northwestern Pennsylvania hosted a special liturgy and breakfast in gratitude for all those who helped to make the 30th annual SSJ Thanksgiving dinner possible. The 2018 dinner, a collaborative effort by the Sisters of St. Joseph and Gannon University, was the 30th annual dinner. More than 100 volunteers prepared, served and/or delivered more than 800 meals to persons who were alone or in need on the holiday. 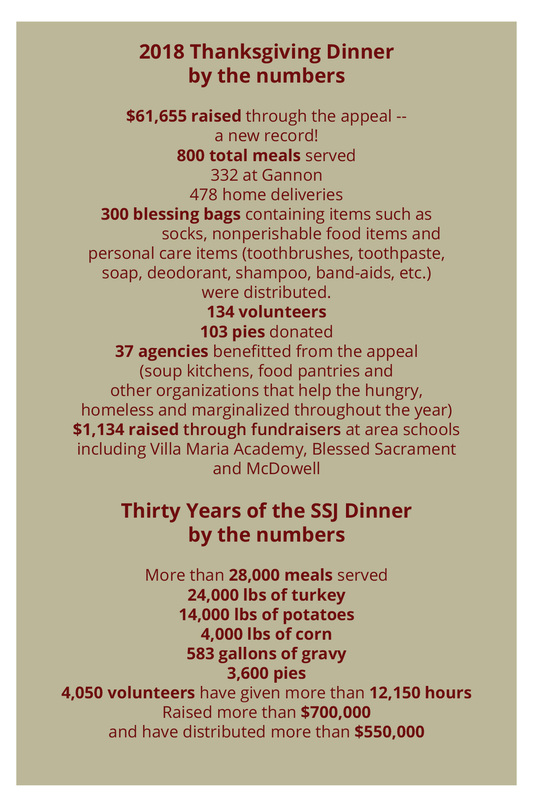 Additionally, more than 700 donors supported the Sisters’ efforts through financial gifts to the Thanksgiving appeal, as well as with food donations. This year’s appeal surpassed $61,600 in donations, making it a new record. Funds in excess of the cost of the dinner are shared with area social service agencies including shelters and food banks that provide resources throughout the year. Funds were distributed to these groups during the liturgy and breakfast event. Thirty seven agencies received donations. Two special monetary gifts established to recognize the Thanksgiving Dinner hosts were also given. The “Peter Lyons’ Thanksgiving Giving Back” $500 gift which honors Lyons for his role in starting the dinner with Sister Theresa Marie Bohren, SSJ, 30 years ago at his restaurant, the Marketplace Grill, was presented to the SSJ Neighborhood Network. In addition, the Gannon University/Metz Culinary Management Thanksgiving Giving Back $500 gift was awarded to L’Arche.